Conceptual photography often pushes the boundaries of what we recognize as real and not real, sometimes even more so than other media; it presents to us what we understand to be a factual image. In her current exhibit at Bridgette Mayer Gallery, artist Eileen Neff plays with perceptions of reality to create photographs that seem both of this world and beyond it. Section of Neff’s Leaf Wall Installation (2015), archival inkjet prints on rag paper. Philadelphia local Neff embarked on a three-week artist residency in Costa Rica in January 2014. She stayed at Monte Azul, an ecological mountain retreat where she created each of the pieces exhibited in this show. During her stay, Neff hunted and gathered for inspiration in unique ways. Coming from a painting background, Neff captures her images and presents them with painterly qualities, in both the composition and the lighting. She noted to me in a recent phone interview that she had photographed every single day, sometimes without plan or true focus, but in a constant stream of consciousness through her camera. An unnatural relationship to nature and a sense of unfamiliarity seem be ongoing themes throughout Neff’s work, as she had become an observer of the Costa Rican landscape and didn’t simply exist within it, but very much beside it. Though her artwork deals with bits and pieces of nature, they are often made to look estranged from their original surroundings and turned into near-technological or scientific figures, rather than organic objects. One of the first major elements that greets each gallery viewer upon entrance into the gallery is a dynamic composition of digitally cut-out photos of independent leaves arranged on the wall in a seemingly random, but still finely tuned, manner. Neff became captivated with the leaves of various Costa Rican trees and plants. She stated that she desired to view the leaves as single entities rather than small parts of larger organisms as they are usually perceived. Each leaf is broken away from its taxonomy and made into the primary subject matter. Neff was interested in making the leaves the primary focus of this exhibition. In another installation piece, “Seated,” the cut-out leaf becomes part of the architecture of the chair it lies on–something taken out of its original environment and appropriated in another. Leaves are not the only natural elements Neff features with great sensitivity and care, however. One of her most enigmatic portraits, “Horse by Car,” demonstrates the painterly and intimate qualities Neff’s images can take on. The quiet image of the white animal set against a black, disappearing background as it shares a private moment of visual contact with Neff’s camera, is also shown through the open window of a car, mediating where the viewer finds themselves physically in the scene. Everything Neff injects into her work is precise and deliberate. While seemingly simple on the exterior, Neff’s pieces are also exquisitely complex. There is a great deal of natural harmony and manmade discord in the pieces, and these elements often overlap each other in surprising ways. Take, for example, her pieces “First Scene” and “Second Nature”. Each depicts a boy holding a mirror in front of his face, showing the viewer its reflection. “First Scene” is representational of the original photograph. The mirror the boy is holding shows the true reflection: a jungle scene. However, since the reflection is distorted, a sense of unreality is projected. 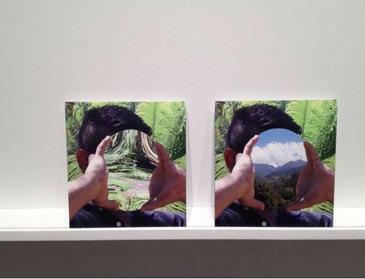 While the nearly identical image “Second Nature” contains a Photoshopped reflection, the clouds and mountain scene seems more likely. Viewers are presented with two nearly identical images, which when viewed side-by-side distort the viewer’s perception of what may be real and what may not. In this noteworthy and captivating show, Neff’s conceptual romanticism (or romantic conceptualism) helps breathe new life into Philadelphia photography. Eileen Neff’s solo show is on view until April 18, 2015 at Bridgette Mayer Gallery in Philadelphia.